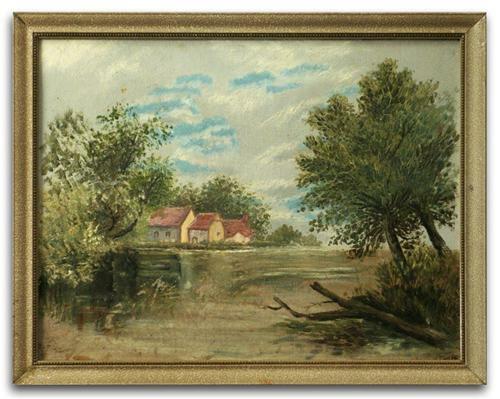 It looks like the artist is depicting a water mill set on a gentle stream lined with willow. As if to confirm this assumption there is some text (or seems to be) bottom left about 5cm from the base of the frame and about the same in from the side. It seems to be saying 'something MILL'. But it's a very strange place to add an inscription. Then again there is what seems to be a signature where one might expect it to be, bottom right. But I have had a 7 x mag. glass on it and I'm still only 50/50 as to whether it is a rudimentary signature or a random patch of water weed. What I particularly like about this painting is time seems to have joined forces with the artist and added some touches of its own. Look at the large willow tree to the right. The artist hadn't bothered with fine detail in the foliage but a crackle has formed in the paint over time looking for all the world like a fine filigree of branches. I originally estimated (took a flying guess) at age, placing it in the '50s. And I was gratified to discover another painting with the same unusual and distinctive faux shagreen (rayskin) finish clearly marked 1959 (see last pic).